Great pillows for the money. Super comfy and have the feel of pillows that cost a lot more money. I am a pillow snob and it takes a lot to make me happy. For the price these pillows were wonderful. However after a few months they don’t seem to sleep the same. I’m sure I will be purchasing more pillows this year because the pillows are also shedding feathers. My first impression when opened the box after arrival, was "oh no, these pillows are huge (thick) and can't be good for my neck." Not so. They lost their fluff just enough that my head sank nicely into them, which is one of the reasons I like down/feather pillows. Admittedly, these are nowhere close to the quality of my Down pillows that cost $100 a piece, but hey ordering 2 of these pillows for just over $53.00 minus just over $10 in coupon savings and a little over $8.00 in Club O savings for a grand total of $34.20 shipped free for the pair, I'm a happy guy. Had I known the quality beforehand, I would've gladly paid $100 for the pair as they are certainly worth that price. nice soft pillows. If you are looking for firm these are not he way to go. These pillows are awesome! You sleep great, because the pillows are not fiber filled and feather filled the difference is like night and day. I like the fact that after purchasing and rejecting every single pillow I ordered over the last several years, I finally rest easy, and I mean well. First, I did not like to order a pillow that was not cruelty free, but alternative down pillows were beyond bad and I tried numerous. That said, these are not for those who prefer flat or firm. They are soft yet supportive and sleep like a baby on side with one fluffed like a squishy. But, when I must sleep on my back or read, they support head without hurting my neck. To those who say they do not like the sound feathers make I find it a non issue and mild; you will need to go for pure down for that. Expect to purchase reasonably priced pillow covers as yes some feathers will escape; again buy down if you want that feature. 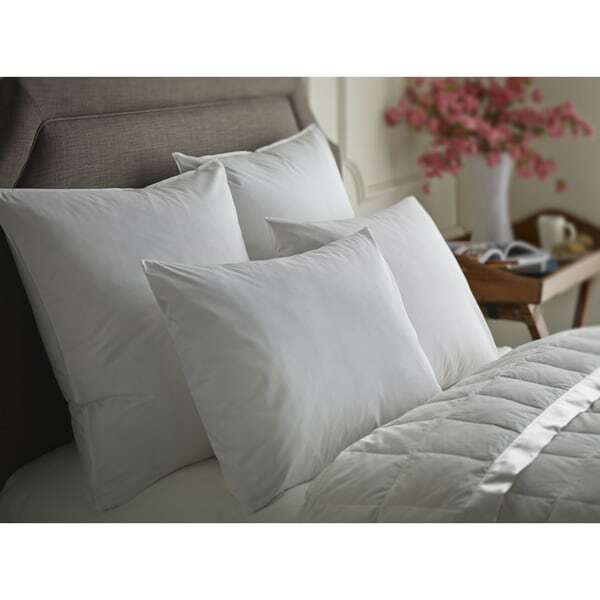 The cost and quality of these pillows make covers worth it plus what price can you put on a good night sleep? Kind of rough, not a 'down pillow' feel. Thats fine for me as I use them as 'back pillows' against the headboard. I would not recommend for sleeping on them. 10 min in the dryer on low/no heat brought all the fluff! No off gassing or odd smell. I do recommend a pillow cover for these. Ideal for this tummy sleeper! Bought a set for the kiddo too. I bought these for my daughters guest bed so that they can be there when I visit. The only problem is I think she may be stealing them for her own bed she likes them so much!!! I will definitely order more. Super plush, cushy and cozy is how she described them. Can’t wait to try them out! Also bought the zippered feather pillow covers which were very reasonably priced. I like these pillows so far...but I just received them a few days ago. But so far, they work better than the last 6? 8? pillows I've bought in the last year. That's a good sign, and I'm hopefully optimistic! The other pillows were too puffy, too firm, too lumpy etc. These are softer, flat, and adjustable under my neck. Two is better than one, it will take some time to get used to these, but I think they are going to do the job. They better, 'cause I'm not buying any more pillows!! The pillows had a strong smell initially. I waited as the instructions said, but finally ended up washing them in the washer and dried them in dryer. The smell was still strong for another week. They are just now tolerable. Wasn't expecting that. Real feathers but they do poke through often. My biggest complaint is how flat they are now. You can try to puff them up but they are just kind of dense and flat down the road. These are the best pillows I have ever had!!!! Well,I’m redoing my bedding and I have never slept on this kind of pillow, so I thought I would give it a try!